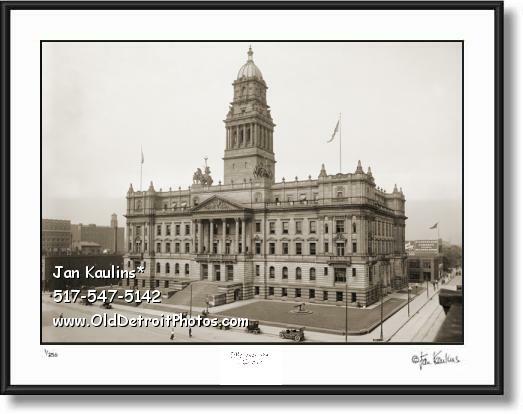 WAYNE COUNTY BUILDING OLD VINTAGE DETROIT photo print picture for sale. This sepia toned black and white Old Wayne County Building Detroit photo picture print was made from the historic original (ca. 1910) black and white negative/photo. It is an excellent portrait of this longtime operating Detroit government building. Parked on the street in front of this historic structure are some very early Model-T automobiles. "The Wayne County Building is a government structure in Detroit, Michigan. It stands at 600 Randolph Street, and contains the Wayne County administrative offices, and once contained its courthouse. The building was listed on the National Register of Historic Places in 1975.Detroit architect John Scott designed the building which stands 5 floors. Constructed from 1897 to 1902, it may be the nation's finest surviving example of Roman Baroque architecture, with a blend of Beaux-Arts and some elements of the neo-classical architectural style. It was built using copper, granite, and stone. The exterior architectural sculpture, including the Anthony Wayne pediment was executed by Detroit sculptor Edward Wagner. The bronze sculpture, two quadrigas, Victory and Progress and four figures on the tower, Law, Commerce, Agriculture, and Mechanics, were made by New York sculptor J. Massey Rhind."